What is A BAAD Show? A few weeks back I spoke with actor, musician and poet Saul Williams before his show in Chicago at Marytrs for a future story for Popmatters. 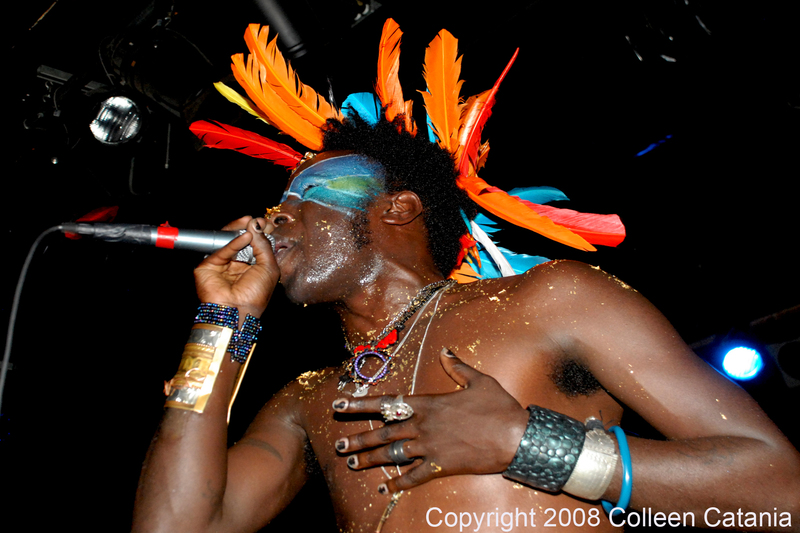 If you’re new to Saul Williams you might have heard his music in a gym shoe ad but he’s being making music, writing books of poetry and making movies for the last ten years and in November he released his third album The Inevitable Rise and Liberation of Niggy Tardust for free or for $5 on his website. Our conversation focused on the album, the interesting title and what it means to the listener beyond the issue of race. And even though I’ve spoken to artists before a performance several times in the past, I have to say that our talk was a pre-show conversation that I will always remember as having a huge impact on how I took in the performance. In lieu of this experience I’ve used an acronym—Before After and During (BAAD)—to describe the dramatic train of events that night and have since discovered that several performances usually follow this compelling trek along the performance transformation timeline, a entertaining journey of stimulation during a performance that we usually take for granted, happy when it goes as expected or better and disappointed when it doesn’t. But during that night each sequence was more pronounced and vivid than usual, making me want to recount the night here. Even though the following recount is a bit out of sequence of the actual acronym, the overall impact of this BAAD theory tends to hold true when I look back at past shows. So let me explain just how much of an impact BAAD played on the night of April 18th. Before: During our pre-show conversation, Williams was dressed in his usual eclectic and eccentric garb of purple coat and green sunglasses. And he spoke deliberately, balancing a calm tone with moments of necessary inflection to get his point across as I asked questions about the album and his career. The feel of our conversation was similar to previous conversations as we covered all the necessary topics and meandered as needed, his responses leaving me excited to see what the show would be like. During: The house lights were brought down and the crowd began to chat and rumble. Stage left Williams marched out on stage in full costume with his band. He was covered in sparkling body paint and sporting a Mohawk of an Indian-chief with feathers shooting off in all directions. I was stunned as how much his stage demeanor had so drastically changed in intensity compared to what it was like during our conversation. Williams had transformed and now the dail was cranked and he stood like a warrior ready to conquer his fans and take us for a ride for the next two hours, as the set caught fire and blazed like a raging inferno, a combination of George Clinton, David Bowie or Sly Stone and Chuck D.
After: Even though I mean after as “after our conversation, I had even deeper thoughts about what had just happened during the ride home; I was in awe and had to settle down, just ask my wife. I thought about other performers and how they prepare to give their fans an amazing performance, even if the fans are not able to see the artist before as I did with Williams’ show. How do artists overcome this hurdle since they obviously can’t have the entire crowd in their dressing room before the show? I’ve read several interviews as artists talk about their preshow routine that lets them know it’s show time. Regina Spector says she puts on lipstick moments before she goes on stage so she knows that is time to perform, French electro-rockers Justice talk about their preshow routine that appears to be a mixture of religion and superstition; other artists pray with band members or meditate and some artist throw up or use a mixture of drugs and alcohol to get amped up (or loose) to perform. So I began to wonder beyond the compelling transformation of my pre-show chat with Williams and think about the importance of preshow rituals and their impact to our enjoyment of the show? And do they even work as much as the artist think they do or are they just a psychological trick to push down nerves and performance anxiety? And how much do us as fans expect the artist to be able to make that leap, a leap that Williams had made and then some, and apparently for him, he needed a full costume. He fed off the excitement of the chanting sold out crowd and part of that audience excitement was a part of his performance just as much as his face paint and furious lyrics, beats and rhythms were. But I still wonder how different the Saul Williams’ show would have been had not seen or spoken with him before the show. Would the show have made such an impact? Would I have felt like something was missing from his performance if I had nothing to compare the onstage personae to? What about the songs specifically? During our conversation we talked in depth about the lyrics and how the songs were changing as they continued to tour. Several moments during the show I flashed back to our chat, checking what he said against what I was seeing on stage. Who Williams was backstage was who he was on stage and I know I would not have been doing that had I not talked with him prior. I am certain that our chat made the show much better than what I would have been. And I mean that in a contextual way, helping me to better understand Williams as he revealed more and more of himself with each passing lyric and furious beat. Before, After and During. This is a new way to look at a show whether I’m reviewing it or not, a perspective that will make me think differently the next time the house lights go down and the show begins. So what about you? Have you ever had a similar experience at a live show? Do you think it’s good to see an artist before their show or not? Do you think it takes away from the show or adds to it?